Do you let them eat nothing? How do you handle picky eaters? Paleo Mom Problem: Let the Picky Eaters Eat…Nothing? For the past 6 years or so picky eating has been my nemesis. Before becoming a parent I had every intention of feeding my kids healthy foods, on demand, not using food as a reward, and not making a big deal out of any of it. BWHAAAAHA! I laugh in that woman’s face. Dumbass. In reality, I have not fulfilled any of those intentions. I have been guilty of feeding my kids toaster waffles for breakfast, WITH syrup, fast food chicken nuggets for lunch, M&M’s (shudder) and more pasta with butter than I can ever live down. And that’s not even counting the constant birthday parties both at school and on weekends where it’s a free-for-all of pizza and buttercream frosting and drink boxes. Loud sigh. Picky eating is my nemesis, but what kind of battle am I really fighting here? Am I making it worse when I offer the buttered pasta next to the veggies? Am I scarring them when I make them try new vegetables and (gasp!) eat non-breaded meat? At dinner time, right at the point where I’m about to go for “mommy time-out” – after one leaves the table to watch TV without taking a bite, another “never gets mac and cheese” and the last doesn’t want the green thing in her burger – I start to think about a time that many of us grown-ups can remember, when parents made a meat, veggie, and starch, put it in front of you and you somehow knew that if you were going to be hungry between then and bedtime that you’d better just eat what’s there regardless of whether it’s your favorite, or even if you liked it at all. It was understood that there wouldn’t be mac and cheese, pizza, and you couldn’t skip dinner and get ice cream and cheerios as a bedtime snack. But now, there’s all this guilt if they don’t eat, and all the frustration of having spent time and energy cooking only to get complaints and rejection. Night after night, for years. What am I doing wrong? After learning about paleo and generally becoming a lot more aware of the health repercussions of consuming a lot of sugar, pasta with butter, and fast food, I find myself even more conflicted over what to do with the picky eating issue. I’ve had this discussion with friends, and a lot of them struggle with it as well regardless of what they choose to feed their families. Last night when my “pasta eater” wouldn’t even eat the pasta with butter I started thinking (after the raging devil voice came out – “what do you MEAN you don’t want the pasta? !”) that maybe I would stop cooking for them entirely. Not that I won’t offer them nutritious meals, but that I would stop trying to guess what will make everyone happy at dinner time – because it rarely works anyway – and start putting some of my dinner on their plates, putting up armour but refusing to battle it out. I hate being at war and I hate giving into the enemy. If you can’t beat ’em, stop fighting at all. The thing is, as much as I consider myself a tough, non-spoiling mom, I am living in a culture that is child focused and pleasure focused. I feel insecure and doubtful when my kids don’t eat because they don’t like the food. It makes me feel like a mean mom of the “no wire hanger” persuasion. My instinct is to offer them cereal or something, when that just sends the message that it’s okay to reject dinner whenever it’s “not your favorite,” as my daughter often says. Even my older daughter, who likes to eat most paleo meals, freezes up when something is not on the favorites list. It makes me anxious, and, honestly, it pisses me off. So, do I let the picky eaters eat nothing if that’s what they choose? Do I deal with the crying when it’s not their favorite? Do I have a chance here or am I just at my wits end and going crazy? How do I get past the guilt of not making them happy? I know that I don’t want spoiled children who will only eat “pleasure foods” and make demands about small differences in their meals. Is there a right answer here? For those of you with picky eaters in your family, how do you deal with the issue? Anyone else at their wits end and looking for answers? Love the “wire hanger” reference 🙂 I’m in the picky eater boat too. Drives me absolutely crazy! I usually give my picky one whatever we are having and she knows she has to try one bite. I typically have a vegetable and fruit offering at dinner and sometimes that’s all she eats! Seriously I feel like the meanest mom sometimes! If I offerred fruit with dinner that would be the only thing consumed for 2 of them. It’s the whining for the favorite foods or the mac and cheese or whatever that get me nuts! And the “can I have a snack” immediately after because they didn’t really eat. Doesn’t help that all 3 of them like different things. Maybe I need to start chatting with your mom for advice! Seriously though I think for my own sanity I need to stop feeling like I need to cater to everyones preferences because it’s making it worse. And I need to get my own emotions under control with it even though it’s beyond frustrating. I’m glad to hear you’re a reformed picky eater! My husband is horrible too and has set a bad example in the past by not eating his dinner either. So really I’m dealing with 4 kids! I’m not excited about that phase at all! I’m at a family reunion and all the snacks we have are processed and packaged, high in sugar. What else can you bring that all the kids will like? So sad. I’m also working with an ADULT who refuses to eat veggies…and he’s trying to lose weight. This will be tough. I took a children’s nutrition online class from Harvard awhile back and my favorite tip they had was to grow a garden and get your kids involved. Or else take them to the Farmer’s Market and have them pick which veggies to use, then help them peel or prepare it for dinner,. Who knows..I guess I’ll find out when I get there. Good luck! The snacks drive me nuts. Although I don’t buy any of it anymore they still get it at school, parties, and friends houses, even gymnastics and dance and things like that. And now that I’m blogging a parent might ask if it’s ok to give something to one of them but since all the kids are already eating I can’t really say no at that point. The farmers market tip is a great idea! The problem is for us it doesn’t work on a regular basis because I’m normally doing the grocery store. All 3 of mine like different things which make it especially challenging! I don’t have kids but growing up, my parents always made the same thing for dinner for everyone. We had some food allergies in our family, so my mom would cater to that, but otherwise we all were given the same and told not to leave until we finished what we were given. Then again, I’ve also seen my sisters get desperate to get their kids to eat and pull out the ol’ PBJ. I think when we were kids our parents had it so much easier since it wasn’t as common to have constant takeout, pizza delivery, and a ginormous selections of snacks at the stores! It was a different culture then and overall kids knew they didn’t have a ton of choice. It’s such a tough call and I never realized how challenging it could be until having 3 kids who all like different things! You are my hero because that’s exactly what I tell myself pretty much every day that I will do…and then something goes wrong and I can’t make it happen. I think I let my emotions get involved too much. I’m very glad we connected up and look forward to checking out your site! What a great topic! Since I don’t have kids my mentality now is like yours was. I’ll make one healthy meal and if they eat it, great, if not, that’s their problem. I went to bed hungry one more than one occasion when I was a kid because that’s how I was raised. My brother was a SUPER picky eater (still is as an adult) and our family only had about 7-10 recipes Mom would cycle through regularly. She told me stories about growing up as a kid and if they didn’t finish their dinner my grandmother would put it in the fridge and make them eat it for breakfast! I think you hit the issue spot on when you said we live in a ‘child focused/pleasure focused’ culture. I realized recently that I made the decision a few years ago to eat foods I don’t love because I know they are good for me, and I’m seeing my bf come to that realization now. Previously he’d eat the same few meals every day because he liked them and is pretty picky. Now ,he’s starting to realize that it’s not going to kill you to eat a meal you don’t really like! I feel like nowadays if we made our kids finish their dinner for breakfast that would be grounds for removal from the home. My how times have changed! – TV is off by default (which now extends to no phones out at the table). – One meal cooked. Period. – Fruit and veggies are not optional. – Between meal snacks (aside from say, an apple) are by-permission only. One the kids were all a few years old, we made sure they realized rule #2 was pretty firm. We would let them make a peanut butter sandwich if they tried but REALLY didn’t like dinner, but then there was no dessert option, period. Because ..
– Dirty secret – no one in an upper middle class home ever starved to death by missing dinner. So I would definitely go with the ‘nothing’ option. And as soon as they realize you mean business, the REAL negotiation can begin. 🙂 Good luck! I love all your rules. They are what I plan to do every day before I get sidetracked and overwhelmed! One thing is that my husband rarely eats with us since he gets home late, and, being a picky and distracted eater himself doesn’t set a great example even when he does eat with us. Sorry to throw him under the bus, but it has an effect. The “how many more bites” I have to laugh at because that is our theme song over here at meal times. You need to whine it in a voice that says you are near exhaustion and perhaps death. The snack and dessert issue goes with that. Although it’s just fruit, veggies or organic yogurt for snack now so at least it’s decent nutrition. I love reading about parenting even though I am not a parent. Your original plan and txa1265’s strategy is what I would employ. It’s how I was raised and I’m thankful for it. I think that as an adult I crave a lot of the things I was raised on. My mother set a great example with veggies, simple protein, a starch. It taught me that packaged goodies were only for a rare treat. I wasn’t a picky eater though…. I think about how long it takes for our taste buds to change – not long in my experience. I was in a pb&j rut for dinner for a long time. For the first few days that I tried something different I was still craving the pb&j. But after a few days, my taste buds started to crave the new flavors. So hopefully after a week (and I’m sure a painful week for you!) the kids might come around and accept that they will have X for dinner. I also liked the feedback from another comment about offering two veggies – letting them pick one. Or take them to a market and say you have to choose one veggie but it can be anything. Then have them help cook it (once, not every time you are trying to rush to get dinner on the table!) and that might make them more interested. This is good sound advice and although it’s my instinct, I am easily influenced by mom guilt and crying whiny kids unfortunately! Most of the comments are reinforcing my inital feeling about this whole thing. I think the biggest part for me is getting my own emotions under control in meal situations so I can approach it the way I plan to. Thanks for the feedback! It’s funny reading these responses. The most confident, no-nonsense responses are from those who don’t have kids yet and don’t deal with this every day. Before I had kids, I was the same way. And I also realized that I probably had a selective memory of some of the things I thought I did as a child :). I have always felt that way but in reality it seems difficult to implement given that there is so much “treat” food around that they recognize as “junk” and healthy food that I encourage them to eat that just doesn’t taste as good! But that said, my pickiest one thinks fruit is dessert simply because she likes it a lot! The psychology behind it all is difficult to get a grasp on. Thanks for the link to the article! They get plenty of treats when they’re not at home – pretty much everywhere else – so I don’t feel like they’re deprived of that. It’s so funny how everyone remembers meals being mostly a non issue growing up (get what you get) and nowadays a lot of parents struggle. The culture has really shifted I think! But all the comments are reinforcing for me to go with my gut and what makes sense. Giving in hasn’t helped at all. Love this topic. My husband and always tell our kids, “You get what you get and you don’t throw a fit.” Haha and yes, I feel mean sometimes, but they eat crap food with their grandparents, at school, bdays, etc, so they get plenty of processed/unhealthy food. My oldest is 13 and he has always been my picky eater. The last few years we’ve made it a point to force him to try new things. The rule is if it’s on his plate, he has to at least eat try it. He is always pretty resistant, but it seems to be helping. He now loves fish, sweet potatoes and I can get him to eat most vegetables. I’ve switched him to Greek yogurt and have fooled him with cauliflower rice and grain free baked goods on a couple occasions. For the greater part of my childhood, my mom was a huge health food nut and only shopped at Vitamin Cottage. I hated it and I complained incessantly, but I believe that I am a better, healthier person (and mom) because of it. You have a great attitude and a great point about them getting the junk food everywhere else. I feel that way all the time and yet at home where I really do have control I wind up giving in to the crying and demands just to keep peace – and then regretting it. 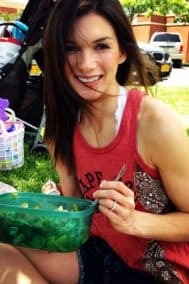 While I don’t think switching to a “one-meal-no-exceptions” rule will solve everything – it will be easier for me in a lot of ways and ultimately better for them I feel. Thanks for your wise words! So I don’t have any kids (Disclaimer) but my parents were definitely of the I-cooked-a-nutritious-meal-so-eat-it variety. And it wasn’t always awesome tasting, but we couldn’t eat anything else, so we just learned to eat it. We were allowed to serve ourselves as we got older, and could take a ‘no thank you’ sized portion. If we refused, she wrapped it up and served it to us at the next meal. None of us are picky. It wasn’t worth it. A gross meal does not improve with time. All this to say: You’re the momma, and a great one at that. Set the rules, buy what you want in the house, and stick by your rules. Kids always push the hardest when they know there’s a possibility that you’ll give in. I love “a gross meal does not improve with time” because it’s very true. I have held the uneaten meal occasionally until it became gross enough that I couldn’t bear to offer it again! I think the shift is all in my control. And thanks to the helpful comments I’m feeling stronger about implementing this! I can’t imagine what it’s like dealing with three picky eaters that all want to eat different things. At this point I’ve just been feeding my daughter things that I know she will eat which luckily at this point includes some green vegetables and a wide variety of fresh fruit. She loves chicken so I have a bunch of different ways to do chicken. Occasionally she likes meat. She will not eat bread. At least not around me. So sandwiches or anything like that, even in her school lunches are out of the question. I am a little mad at myself for catering to her tastes so much, but I figure her tastes could be worse and I’m totally prepared for them to become worse at some point. Sounds like she’s not too picky for a kid! My oldest daughter basically eats like that and I have no problem with her for the most part (although she will complain about pasta ironically) but the other 2 are really the reason this issue gives me gray hair! I feel like good eaters mainly remain that way so you might be in the clear! I agree with txa1265 and all of his rules. My kids are 4.5 and 2, and I would say 90% of the time I only fix one meal (usually paleo) but occasionally I’ll fix an extra dish like mac&cheese if I’m trying a new recipe and I’m not all that confident it’s gonna turn out well 😉 Sometimes they eat well, and sometimes they don’t, but we do engage in the “how many bites” battle (usually 2-4) before they can be done. One big rule for us is that they have to stay at the table until everyone is done – if they don’t like dinner, they don’t have to eat, but they have to sit with the family (this is trickiest with the 2 year old!). I often remind myself that the most important thing is to stick to my guns. Yes, they ask for a snack right after dinner, and yes, when my answer is “if you’re still hungry you should’ve eaten more dinner” there is crying, but as long as I don’t give in, you know what happens? They stop crying and eventually move on to playing. For me the hardest part is the afternoon snacking! We all get home around 3:45, we’re all hungry and start snacking, and then they’re not as hungry for dinner. I have to get better with the “sticking to my guns” thing because plus i need to get my husband on board! He is kind of my 4th kid 🙂 I try to implement the “no snack if you didn’t eat dinner” but it rarely hold through till bedtime! I might have to start saving plates again like I’ve tried a couple of times and like a few commenters said their own parents did. Somehow though that makes me feel like a tyrant! I know they won’t starve, but I think I’m more worried about the emotional repercussions. I’ll have to test it out and first and formost get my own frustration under control so I can approach it calm and just “this is what it is.” Thanks for all your insights! This is one of the things that scares me about being a parent someday! When I was growing up, we were too picky, but we didn’t always love my mom’s cooking (love her, she’s a wonderful mama, but cooking is not her strong point), and that’s where things got scrappy. The rule was that there was one option for the meal – whatever Mom had cooked. If you didn’t like what was served, that was fine, but it would be wrapped up and saved in the refrigerator until the next meal, at which point you’d be given another chance to eat it, and so on until you ate it. None of us were psychologically scarred by it, and it taught us that food is food…even if it’s not your favorite, you’re lucky to have it, and it still serves the purpose of giving you energy, nutrition, etc. I have to remember to think of it that way – that offering healthy choices is helping them and not hurting them – even if they protest A LOT! I love your mom’s attitude. And that’s exactly the message I really WANT to send my kids, I just have to become more comfortable with implementing it! Thanks! I am feeling so much better with all of these comments to go “all the way” with just cooking healthy meals and having the “tough” approach of letting it be, whining and all. I just know in the long run it’s the best way to go for their health and my sanity (not to mention budget, that’s a huge one!) Glad to hear your perpective and that none of you are scarred 🙂 Modern parents like myself need a wakeup call sometimes! I have three sons (12, 9 and 5). We were super lucky with our oldest because he loves EVERYTHING – he’s even been known to prefer a salad bar over a cheeseburger. But the youngest two are picky eaters. We try to maintain a reasonable grocery budget which means making a lot of beans, rice, veggies, tofu, etc. Some of the meals made are not received well (especially by our five year old). Because we don’t do treats often, we reserve treats for the nights when we know mealtime will be a struggle – this gives an added incentive to eat what they would otherwise spend an hour + complaining about. We don’t make custom meals – we just cannot afford to. But with that being said, we make sure to alternate favorite meals into the schedule – like pizza every Thursday. You do have a chance. Our middle son used to not like anything but after making him eat small portions of everything, he’s come around. He still is what I consider picky but he doesn’t complain about eating anything – this could be because he understands it’s a fruitless endeavor. Maybe I’m a hardass but I came from a family of seven brothers + one sister and we ate what we were served and I very much have that mentality with my own family. Even if my five year old chooses (and he often does) to sit at the table for hours until bedtime without eating – he is not going to get another meal and I don’t feel guilty because sometimes he won’t even try something before he decides he doesn’t like it and that just won’t fly with me hahaha. Ahhh, the joys of parenthood and “mommy guilt”! My kids are all older, my youngest is 12, and we never catered to the picky phases they each went through. The only thing I would do is if there is an ingredient in the meal that the child truly couldn’t stomach, I would alter their piece of chicken or whatever we were having. For example, my oldest has an issue with breading, and so when I make something that is crusted in almond flour etc, I don’t put it on his. For my daughter that item was olives, my youngest is picky across the board, but eats what is on his plate because it’s the only choice. As an older mom (sigh, never thought I’d feel like the oldest in the bunch at 42, but here we are) I can say that your kids will still love you, even if they don’t love some of the meals. My kids that are at home hate that I won’t buy packaged crap for snacks and lunches, and let me know ALL THE TIME. It hurts my feelings for a bit, and then I remember, they are kids for goodness sake! At some point, they will be going through this with their children (if they choose to have them), and THEN they’ll understand, but not before. Secretly, I think they are proud of how healthy we eat because all of their friends know about it, and my kids can spot an unhealthy option a mile away, and sometimes, they go so far as to not eat said unhealthy option. That’s a good day. All in all, what your kids will remember is not going to bed hungry a couple of times because they were testing the boundaries, but that they have a mom who loves them enough to do the hard stuff. Sorry so long, but I know how mommy guilt makes us all second guess ourselves. I am right there with you! 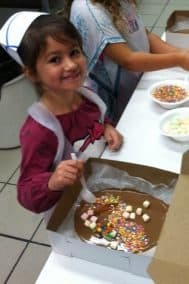 My daughter is seven, I actually found your blog because I was looking for ideas for lunches. We recently went to the doctor for her checkup. He said in front of her, serve dinner, give the kids a small amount of everything including dessert (if you have a dessert) a kid age 4-7 has to take 2 bites of EVERYTHING before they leave the table, they can eat the dessert first if they choose. Then no more food is given the rest of the night (unless of course they eat the meal and they are hungry a couple hours later). She has really listened to him, there is still a struggle once and a while, but she remembers his words. He also said, let the kids pick dinner once or twice a month and the key is the whole family eats it. So if it’s mac n cheese or nuggets, you are on the hook to eat it, but then you can say, when they say “we never get any mac n cheese for dinner” you can say, we absolutely do, now eat your food! He also said we live in a world where we can get food from around the world, fruit during winter months (we live in MN) and that is a privilege. And you can also say, I am the parent, you need to do this because I said so. End of story. Good luck! Glad I am not the only one!!! It’s such an ongoing issue with the picky eating! I’ve gotten much much better with being consistent and just making one meal, and as it turns out, my kids are a lot more resilient with this than I initially gave them credit for! They eat every night and don’t fuss about it the way they used to. My pickiest, while not thrilled by every meal, doesn’t demand and cry the way she used to. I think your doctor’s idea was really good, and our kids will be fine! Hi Michele, I love this post and I read the first several comments as well. I have 2 kiddos: 6 yr old boy and 3 yr old girl. I’m on the tail end of a Whole30 and beginning to feel like the BIGGEST hypocrite that I’m feeding myself so many wonderful foods and still slopping mac n cheese and frozen waffles (with organic maple syrup!) to my children. If it weren’t for the baby carrots and bananas (for him) and apples (for her), their diet would be entirely wheat and dairy. But as of this moment, I’m SO over it. I feel like fighting their pickiness is driving me crazy and taking so much of the fun out of 2 of my favorite things in life (1) being their mom and (2) cooking. I also just read Sarah Fregoso’s post about this topic: http://everydaypaleo.com/kids-eating-real-food/ and I love her idea of taking it meal by meal and step by step. How is going for you? I see that you wrote this post back in July – any baby steps since then? Since I wrote the post I’ve made big changes! I stopped making more than one dinner. At first it was tough for my middle and younger one but I would save their dinner if they didn’t want it and let them go without eating at all a couple of times. I didn’t get upset or make a big deal about it but just stopped serving the pasta/etc. If there’s a veggie involved that none of them like I just cut up peppers, carrots, or cucumbers instead. I’m actually amazed at how much meat they eat now! It took about a week before everyone understood it. The other meals aren’t much of an issue and at this point my kids are eating much healthier although not strictly paleo by any means. When they’re at home they eat what’s here, and for budgeting as well as health reasons I just don’t buy packaged stuff anymore! I think the transition takes a while and also needs to be deliberate. The biggest thing I’ve realized is that I don’t HAVE to buy less healthy things just because someone likes it. I just buy whole foods now (still include organic yogurt and milk) and eventually the kids do come around. When they eat out now or have cake at a party it’s a big treat, and they view it that way. Everything feels more balanced. What about a toddler who is 1 year old? I’ve had her on a paleo diet since she started on solid foods, and she used to gobble down practically anything I put in front of her. It was so easy. Loved vegetables. I tried to keep the fruit and anything else that was sweeter to a healthy minimum so that she wouldn’t start wanting sweet stuff instead of veggies. I really thought this plan was going to work and I would not have any trouble feeding her. But……all of a sudden she is 14 months old and is starting to refuse to eat what I put in front of her. She just keeps saying Hungry Hungry but will not eat the food right in front of her. It is soooo frustrating because I cannot afford to be wasting food. The only thing I can think of that has changed is that I just started giving her these Fig Bars occassionally, they are not paleo. They are gluten free and sugar free but they do taste sweet and kind of like a fig newton cookie. Also, her babysitter has continued (despite my multiple requests for her to stop) to give her extra fruit other than what I have packed her for the day. I think it is too much. Is that what happened? Have I ruined my baby’s willingness to eat nutritious foods because she has been getting too many sweet things? Do I just cut out all sweet stuff out and hope she goes back to eating veggies and lean meats? I am probably stressing about this more than what is necessary but it is important to me that she gets all the essential nutrients that she needs. I think it’s fine for kids to eat lots of fruit, it’s healthy, sweet but not artificially so. I also find with my kids, husband and myself that the more treats we have, even “paleo” treats, the more sweet food we crave, so that definitely plays into what we choose to eat. All that said, definitely check with your child’s pediatrician/primary care provider about any concerns with her nutrition, especially if you’re stressing! The older she gets the less you will stress about it, a year old is a tough stage! Thank you for your rant. My picky eater used to be the one that ate everything. My girls have completely flip flopped on their eating. I am definitely at my wits end. We keep to the one bite rule and I am considering keeping fruits always available. The picky one almost always will opt for a fruit plate if she has a choice. I guess at least she isn’t eating nuggets and chips. We also switched to at least organics if she wouldn’t eat paleo. Hopefully we will get there someday. Trying to be patient, but the wine usually calls when she gets really loud. Ha-ha! I have even sent her away from the table in tears so that I don’t scream. Thanks again for your blog. Glad you related. Things are SO much better here now than when I wrote this. I went somewhat strict paleo with them for a while just to get them to actually eat real food, but once that started working I’ve become more relaxed with what they eat, and surprisingly they all still eat the good stuff! My son, who’s 4 is now the pickiest, especially with veggies, but there’s only so much you can do. I know that frustration though, it’s the worst. Lol, I commented on your old should kids be paleo post, which was VERY different to this one. I see now you’ve got them pretty much on board 😉 two of my kids are dairy free due to intolerance, and one has a little butter and goats cheese. They have rice occasionally, and two eat some corn in the form of cooked vegetable or popcorn made at home. Our meals have always been one meal for all. We generally put food in the middle of the table and either serve as requested or let them serve themselves. Our options are always whole food and I ensure ONE whole food option in each meal will be liked by everyone, even if it’s a pulse like dhal. My kids all eat a huge variety of foods, but then so do both of their parents ( there has been a study done that the fathers eating habits influence the kids more than mums ). 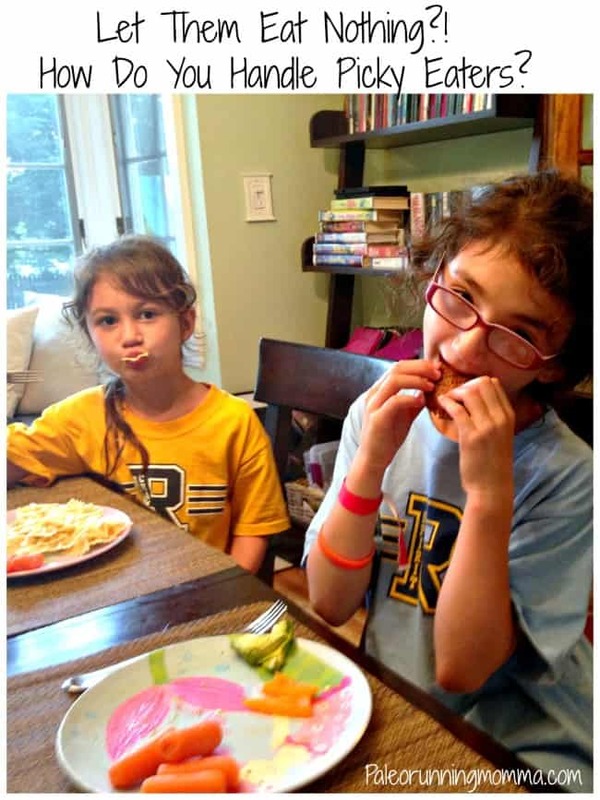 The two eldest are great eaters, always ( my 12yo daughter out eats us at every meal! ). My youngest, 5yo has ” opposite days ” all the time. That chicken he LOVED last Tuesday, to the point of eating all the left overs and gnawing on the frame? Yeah, today he HATES chicken! That cauliflower which tastes like poison? Now he’s begging in the grocery store to buy one bigger than his head…and actually eating it! Finally, I’ve noticed with my kids, they have carby days and they have protein days. They have huge eating bottomless pit days, and they have eating like bird days. They have bored asking for food al the time days ( if you’re hungry go eat some nuts…no? Well you’re not hungry then! ) and days where they don’t stop playing to even eat the paleo cupcakes I’ve baked them. Point is, if you remove the junk and the rubbishy, they will go back to healthy eating, they will hear that voice inside that tells them what they need, and if you trust that, don’t fight it, look at the requests or the food communications without fear, eating becomes a pleasure, not a battle. If they eat well, good wholesome food, INCLUDING snacks in the day, dinner doesn’t have to be this holy grail meal that must be consumed. If they come in after school hungry, feed them up on good nutritious snacks, even stuff you wouldn’t consider a snack…like a tin of tuna and some home made sunflower seed crackers with avocado…then if dinner doesn’t happen, you KNOW they have eaten well and it’s a non issue. Maybe also try a cut off time? We have a cut off for the youngest 1.5hrs before we eat dinner. The older two 12 and 8 are very good at eating exactly as they need when and where and don’t fill up before meals. I wish I had come across this 2 years ago. 4 years ago, really…. But it wasn’t written then. ?I’m relieved to know I’m not the only “pushover” as I call myself. I know better than to let my kids run every aspect of our lives, so why does it still happen?? We actually own a restaurant that serves healthy, fresh, delicious food, but al my kids “want” from there is cookies. Time to draw my line in the sand and do what’s best for all of us!! Whether any of us like it or not. Love your site. This post is my life! I notice it’s from 2014. Did you ever write an update? How are your kids today? Any tips? I’m paleo but I’m having an impossible time with my kids – all three like different things and all degrees of picky. The more I can read about transitioning to healthier eating, the better. Thanks for sharing! Hey Alexis! I think I’ve shared bits and pieces along the way but not sure I wrote an official update (might be forgetting though) As for how things are now, it’s a mix. For dinner we all eat whatever Paleo meal I’m making, and I’ve figured out “kid friendly” recipes like sweet potato fries, burgers, meatballs, taco salads, etc that seem to work for everyone. Overall it’s a whole lot easier than it was, although I don’t require my kids to eat strictly paleo other than the family meals I make. It’s a balance and something I’m always trying to work on. I relate to all 3 wanting different things though, I think once they’re older it’s easier to reason/compromise with these things. Plus, I always have grain free and paleo treats like cookies or muffins on hand that seem to make everyone happy. Mr 3 (and hubby) are the picky eaters in my family. Being the only paleo eater makes it tough; I’m sick of making several meals, and constantly fighting with Mr 3. In the end, I’ll put a timer on, and tell him that if he doesn’t eat, he goes to bed without food. Sometimes he really struggles with what I give him, but he whines and insists ‘its yucky for me’ instead of telling me that he doesn’t like how I’ve put his food on his plate. Argh!!! Going bonkers as I’m sick of all the fights! !